If you like to see me making a pair of sandals please copy & paste the link below to your browser. In my shop, you will find colorful handmade leather sandals made with 100% genuine high-quality Greek leather. 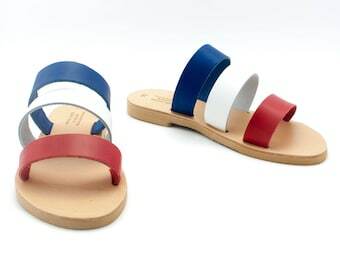 The sandals are very strong making them durable but also light and comfortable. If you have any questions don't hesitate to ask me. 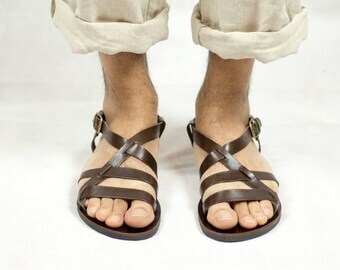 Bronze Greek sandals with ankle strap, handmade to order and available in 19 colors. Braided Bronze Greek sandals with ankle strap, strappy sandals, gift for her. Beautiful sandals. So well made and unique. I will be buying from Nikolasandals again. Had to wait a couple weeks to get these, but they were worth the wait. These are the cutest, most comfortable sandals I've had in a long time. First day out of the box I was visiting relatives and did a LOT of walking—no breaking-in time required. They were comfortable from the start. VERY well-made, real leather, NO SMELL like with so many other products these days. I love the unique design and have gotten lots of compliments and people wanting to know where I got them! Will definitely order more styles from NikolaSandals in the future. Wedding sandals embellished with white lace and pearls. The sandals are delivered in a beautiful cotton fabric bag inside a box perfect for a gift. If someone told me in 2008 that I would be making sandals for a living, I would have never believed it. I have studied animation and I used to work as a motion designer in advertising and television in Athens, the Greek capital. In 2009, like thousands of others, I got laid off from my job in a television channel due to the crisis that hit Greece. I decided then to make a fresh start and go back to my village in Corfu island where I grew up and live in a much less stressful environment, surrounded by nature. Working with leather is not new to me. During the 80s and the 90s my parents had a leather studio where they made bags, belts etc.. I grew up in that studio watching them work and I consider myself a 2nd generation leather crafter. The idea to work with leather came naturally and I thought to myself, why not! I was lucky because at that time of turmoil in the country, I could find affordable second hand machines that I needed in order to start making sandals. During the first year I started with only three designs and with a naive enthusiasm I hopped into my car and drove halfway across the country in search for stockists willing to buy my sandals. I only use the best leather that I can find. For the sole, I use thick cowhides from the island of Crete. They are strong and durable but also light and comfortable. For the straps I mostly use vaqueta leather from Greece or from Italy. During the past few years I see more and more people are starting to create handmade items again. There is a shift towards locally made quality items. Corfu island has a disproportionately large amount of sandal makers. I'm proud to be part of that community. Etsy is an obvious choice as a window to showcase my work. The idea that my sandals are being worn in places all over the world, brings me enormous joy. 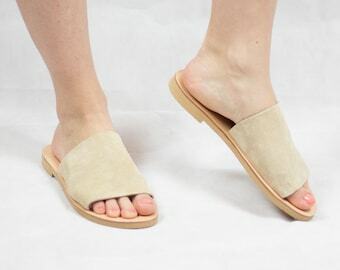 I design, cut, sew and create leather sandals. I may store and process your information through third-party hosting services in other counties, outside the EU. As a result, I may transfer your personal information to a jurisdiction with different data protection and government surveillance laws than your jurisdiction. If I am deemed to transfer information about you outside of the EU, I rely on Privacy Shield as the legal basis for the transfer, as Google Cloud is Privacy Shield certified. All the sandals in my shop are made to order. In order to be precise on the size please do the following: On a piece of white paper, make a sketch of your foot. Measure from the heel to the big toe diagonally in centimeters and send me the number. This way we will have the correct size. The last picture of every listing shows a drawing on how to correctly measure your foot. Please contact me in case you have narrow or wide feet. Don't hesitate to contact me with custom and personalized orders.